Take a tasting tour of the diverse and complex Archetype line of small batch cigars with the Archetype 5 Cigar Tasting Panel Sampler. Showcasing 5 unique, small batch blends from the esteemed Ventura Cigar Co., this sampler is jam-packed with high quality, rich and flavorful blends at a convenient price. These cigars were very nice cigars to smoke. Each cigar had a different flavor profile. The draw was effortless and the burn was perfect. The burn time was about an hour on each of these cigars. I would give these cigars a "92" rating. 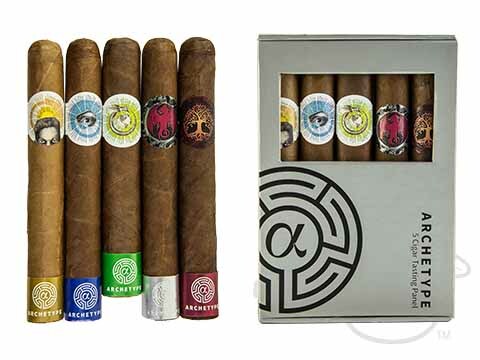 Archetype 5 Cigar Tasting Panel Sampler is rated 5 out of 5 based on 1 customer ratings.